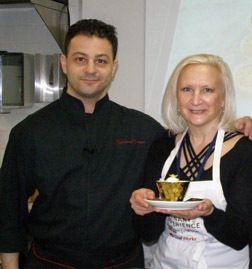 I had the opportunity to learn Chef Joël Robuchon's pastry art taking a class with Pastry Chef Salvatore Martone of L'Atelier de Joël Robuchon as part of the New York Culinary Experience hosted by New York magazine and The International Culinary Center. I have been following Chef Joël Robuchon's career ever since I met him in 2005, during a multi-chef gala awards dinner at the Hotel Adlon Kempinski in Berlin, Germany, and was impressed by his culinary genius, and elegance of style. Born in Poitiers, France, Chef Joël Robuchon has had many culinary successes throughout his career including receiving 27 Michelin stars, the only chef to hold this worldwide record, and has opened restaurants around the world in Paris, London, Monaco, New York, Las Vegas, Tokyo, Nagoya, Macao, Hong Kong, Taipei, and Singapore. He also has written many cookbooks. On April 29, 2012, I had the opportunity to experience his culinary focus up-close through a class taught by his Executive Chef Christophe Bellanca and Pastry Chef Salvatore Martone of his two-star Michelin restaurant, L'Atelier de Joël Robuchon located in the Four Seasons Hotel in New York, entitled "Joël Robuchon - 3 Classic Dishes." 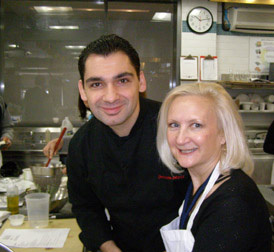 I enrolled in the 2 hours and 15 minute class as part of the two-day New York Culinary Experience hosted by New York magazine and The International Culinary Center. Cooking with Pastry Chef Salvatore Martone provided me with the opportunity to get to know not only the impressive culinary style of Chef Joël Robuchon where the focus is on simple, very delicious food, that is beautifully presented; I also had the opportunity to get to know a little about Chef Salvatore Martone. 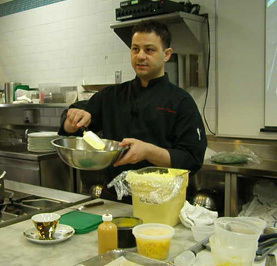 Hailing from Naples, Italy, Chef Salvatore Martone honed his culinary skills by attending such prestigious schools as the School of Culinary Arts in Naples, the Instituto Arte Culinaire in Venice, and The French Pastry School in Chicago. He has learned the style of master chef, Joël Robuchon by working at several of Chef Robuchon's Michelin starred restaurants, and has been the Pastry Chef at the L'Atelier de Joël Robuchon in New York since 2010. When not working in the kitchen, he likes to read cookbooks and get ideas for new recipes. L'Atelier de Joël Robuchon graciously shares the recipe for their signature dessert, Mango-Mango (Mango-Mango onctuosité à la mangue et au coulis exotique). 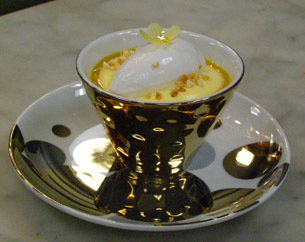 Please read the Chefs' Recipes section for an interview with Chef Christophe Bellanca of L'Atelier de Joël Robuchon and the recipes for La Coriandre en fin velouté glace (Chilled Coriander Soup), and La Langoustine dans une papillote croustillante au basilica (Crispy Langoustine Papillote with Basil Pesto). Method: In a pan mix all the ingredients and slowly bring to a boil. Strain it and keep it in the refrigerator. 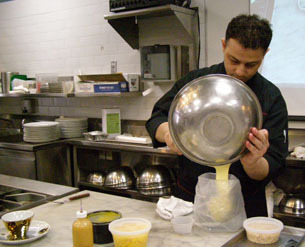 Method: Mix all of the purees together with the powdered sugar and bring to a light boil. Add the gelatin. Put the mixture inside a bowl and let the bowl rest on a bowl of ice. Whip the mixture energetically and add the yogurt. Put the bowl back on top of the ice and incorporate the whipped cream. Diced Mango Method: Peel the mango with a peeler and dice into 8mm cubes. 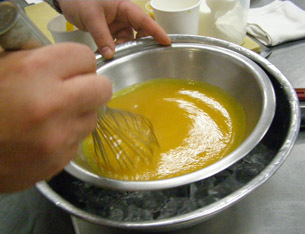 Mix the diced mango with the mango coulis. 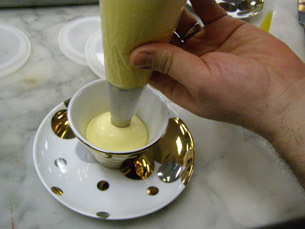 Place the coulis in a squeeze bottle and squeeze it all around the inside of the bowl to rim the mousse. 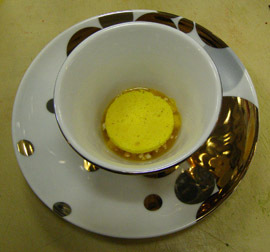 At the restaurant, they place a thin circle of dacquoise on the bottom of the bowl, add the diced mango, pipe the mousse, rim with the coulis, top with a quenelle of coconut sorbet in the center, sprinkle it with "puffed rice", and garnish with a "flower" with a gold-leaf center. Read about the Joël Robuchon - 3 Classic Dishes class in the Gastronomy section and an interview with Chef Christophe Bellanca and more of the recipes from the class in the Chefs' Recipes section.